Over the Thanksgiving holiday, I spent the weekend with my grandma and introduced her to my baby daughter Georgia, her great-granddaughter (who takes her name). Throughout the weekend, she reflected on raising her seven children in the ‘50s, while also working as a nurse, eventually receiving her master’s degree in social work and continuing a career in that field. I realized what a blessing it was to spend such joyful time with a loved one whose life experience far outweighs my own. I hope to one day have the wisdom and wellbeing to share occasions like this with my grandchildren. Regardless of religious beliefs, times like these are what the holiday season is all about. This touching reminder has me thinking about how to prepare for the December of my life so I too can contribute to rich and meaningful moments when I reach my grandma’s age. A healthy diet high in anti-inflammatory foods is a place to start. Thanks to advances in medicine, Americans are living longer than they did decades ago. Although, simultaneously, the rates of chronic disease have risen, with a considerable portion of these ailments belonging to the category of cognition. Diseases of the brain, as well as chronic diseases in general, often involve some level of inflammation. Both ginger and turmeric have demonstrated the potential to act as anti-inflammatory agents and contribute to long-term health. Where cognition is concerned specifically, both spices have been individually studied in the setting of neurodegenerative diseases, including Alzheimer’s. In one study, ginger extract was found to ameliorate the symptoms of Alzheimer’s disease, and another proposed that the active compounds in ginger, namely gingerols, shogaols and zingerone, target biological pathways that may aid in the management of the disease. 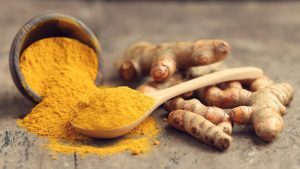 The compound in turmeric that is most widely studied for its health effects is Curcumin, and several studies have examined how it may aid in the prevention and symptom management of Alzheimer’s. In this medical journal article, a review of the mechanisms of Curcumin are provided, which includes anti-inflammatory and anti-oxidizing effects as well as a discussion of Curcumin’s effects on the heme oxygenase pathway, beta-amyloid plaques, metal chelation and cholesterol. From a current understanding of Alzheimer’s, each of these factors has potential to contribute to causation of the disease, while the specific actions of Curcumin may provide relief. Much remains unknown about diseases of the brain, but while medicine continues to evolve, consuming a diet that includes both ginger and turmeric appears to be a safe and effective way to contribute to the reduction of disease risk. However, we always recommend discussing dietary changes with a medical professional. Both ginger and turmeric are considered “warming” spices, which makes them ideal ingredients for this time of year and gives reason for the practice of using ginger in traditional holiday sweets. The new line of The Ginger People turmeric products is an easy, delicious and satisfying way to incorporate turmeric into the diet. (To increase absorption of turmeric, some of these products include black pepper, which has been shown to increase bioavailability.) To get a seasonal dose of ginger and celebrate the holidays this year, share The Ginger People co-founder Abbie’s Chewy Ginger Snaps with your loved ones. From our ginger family to yours, we wish you a happy holiday season filled with many rich and memorable moments (and lots of ginger and turmeric).